Though drones typically conjure up thoughts of missile strikes and surveillance, a pilot project underway at beaches in Chile is considering using the unmanned aerial vehicles to deliver lifesavers to swimmers in distress – all in a rapid 30 seconds. The drones in the pilot program can fly about three-quarters of a mile and have GPS for navigation to accurately drop a lifesaver near a victim. The 30-second timeframe is important because someone drowning can struggle on the surface for 20 to 60 seconds before submersion occurs. 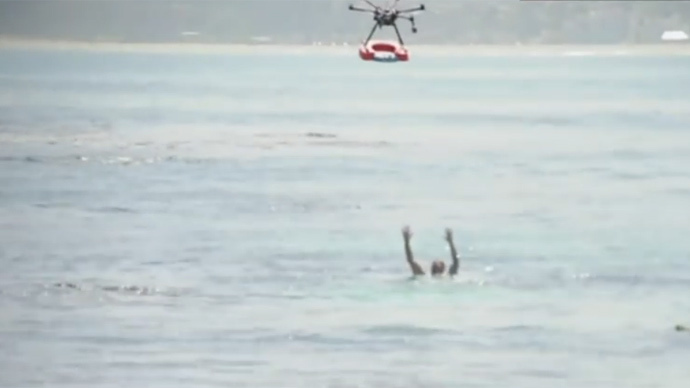 The drones are also equipped with external speakers that can give reassurance to swimmers in order to compensate for the time it takes the lifeguard to swim to the rescue – sometimes as much as three minutes. Onboard video cameras give lifeguards on shore a view of what’s happening to the victim, and LED fixtures can help with night rescues. However, it’s unclear what the timeframe would be for actually implementing drone-assisted rescues. The US Centers for Disease Control and Prevention (CDC) said drowning is the leading cause of unintentional injury death worldwide and the highest rates are among children. “From 2005-2009, there were an average of 3,533 fatal unintentional drownings (non-boating related) annually in the United States – about ten deaths per day. An additional 347 people died each year from drowning in boating-related incidents,” the CDC reported. That’s an annual average of 800 people. The program in Chile is being run by Green Solution and X-Cam, but Slate reported that other companies are also working with lifesaver drones, like RTS Labs in Iran, which has created the Pars drone. Popular Science said the same Iranian lab is working on floating stations with solar panels for recharging drones, and advanced drones that can save lives on their own.